Are you paranoid yet? Have you seen Lil' Slugger? Or is it all just a wild, disturbing delusion from a has-been toy designer? Satoshi Kon's Paraonia Agent is a beautifully unusual series that omits traditional anime stereotypes, and the soundtrack is no exception. Composer Susumu Hirasawa (Millenium Actress, Paprika) takes listeners on a schizophrenic journey to unbelievably simple, yet beautifully strange compositions, relentlessly shifting with the hum of electronic whirring, breathless beats and infectious chanting spliced in. The title track from the TV series (Dream Land Obsessional Park) is a haunting, visceral incarnation that takes on a life of its own, and of course, is absolutely fantastic. You *think* you've heard it through your TV's sound system... you haven't, trust us, the CD version will send you through your seat. We don't want to "beat" a dead horse, but the "impact" of this soundtrack will "strike" a chord with you, until you're convinced you've got "bats" in your belfry. Just don't listen alone in the dark. A young woman who designed a best selling line of stuffed toys. An oversexed reporter who can't pay his bills. A popular schoolboy who's losing his mojo. A teacher at war with her split personality. They're all connected somehow. They're all part of a complex equation. And they all got hit over the head. It looks as though some kid on roller blades is prowling the night knocking people senseless with a baseball bat. 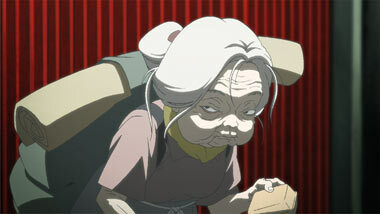 Satoshi Kon (Millennium Actress, Tokyo Godfathers) has teamed up with Madhouse Productions (Metropolis, Captain Harlock) to come up with a surreal series that's hard to define, and impossible to deny. Is it FLCL meets Twin Peaks? We're not sure either. 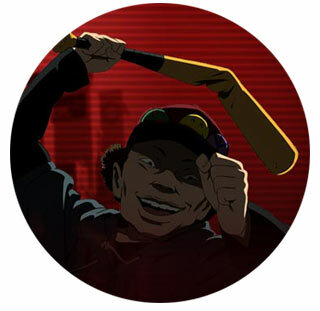 Paranoia Agent is in a class by itself. It's brilliant, and it's out to give anime in general a severe concussion. 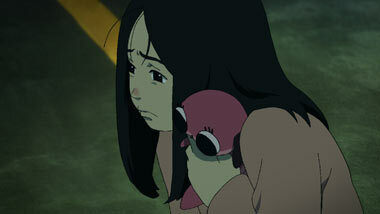 Below: Scenes from the haunted looking Paranoia Agent. 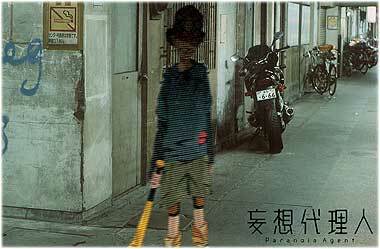 Below: Promotional artwork from Satoshi Kon's Paranoia Agent.